George is a dog who wants to be good but cannot resist temptation. Or can he? He tries very, very hard but when he sees that really delicious cake, what will he do? Perhaps he can be good, but not for long.. This picturebook is strikingly illustrated and is very funny. Shortlisted for the Roald Dahl Funny Prize, it deals humorously with a dilemma we can all relate to. This is a book that’s great for joining in and talking about. Read the story aloud, taking time to talk together about the pictures as you do. 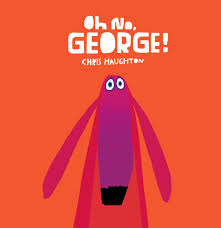 When you read ‘What will George do?’, encourage children to think what might happen next before turning the page to see if their predictions were right. Harris is surprisingly calm when he comes home to find the cake gone and the house a mess. Talk about this together, asking, ‘What did you expect Harris to say or do?’ and ‘ Why was George so good when they went for a walk? Talking about the book deepens children’s enjoyment and understanding of the story. Read the story again, this time leaving spaces for children to join in with the repeated phrases. Children can use small toys for George and Harris to act out the story. It’s a really good way for them to get to know the story well and helps to build their confidence with books. At the end of the story, George is trying to decide what to do about the rubbish. 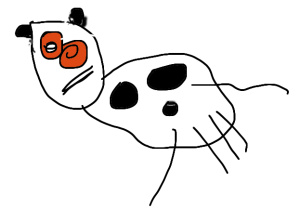 Children can draw a picture of George with big thought bubbles to show what he decides to do. Use paper or card and coloured pens to make a little lift-the-flap book about George and his temptations. Lift the flap to see what George will do!